Could your business do with some free one-on-one advice? Then jump aboard the Small Business Bus. 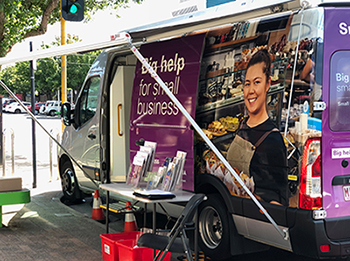 Hitting the road throughout Victoria, the Small Business Bus – a travelling office on wheels – delivers free 45-minute confidential mentoring sessions on all aspects of running a small business including planning, staff management, marketing and cash flow tips. Clients from metropolitan Melbourne and across regional Victoria can access a pre-booked individual session with one of around 100 mentors with a background in a diverse range of industries. All mentors who operate on board the bus are members of the Small Business Mentoring Service. Provided by Small Business Victoria, the bus service is designed for all industries and skill levels. So, whether you’re at the start of your business journey or a small business veteran, it can put you face-to-face with an experienced mentor to help you nail down a strategy for long-term success. Launched in 2010, the bus tours from February to December each year to a pre-determined schedule throughout the state to help businesses innovatively grow and to boost local job numbers. So successful is the initiative that in February 2015, a second bus was introduced (and continues to run) to meet demand. Try it for yourself. Book in now for your free one-on-one mentoring session to get your business moving. Find out when the Small Business Bus is heading your way.